Let's just add this to the list of "things to make when company's coming over." I'd say you should try it once for your family before such an occasion, but that's just because the chicken cooks at quite the high temperature and if you're not used to a smoking 450 degree oven, you might lose your cool. This recipe starts off with an herb butter and ends with crispy skin and a lovely sauce. Delightful. Preheat your oven to 450 and place the rack on the upper level. 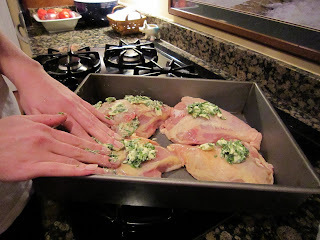 Here's an important step- rinse 4 skin on bone in chicken breasts and then pat dry. Get that slimy chicken juice off. In a small bowl mix 4 Tbs. unsalted butter with 2 Tbs. chives and 3 Tbs. 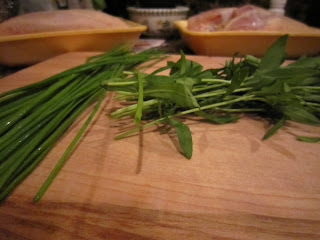 chopped tarragon. 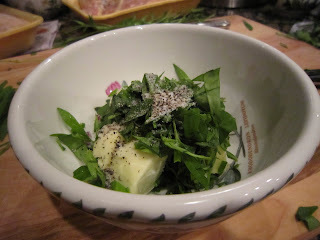 Use your fingers to rub the herb butter under the skin. Go on- get in there. Season with salt and pepper and place in a roasting pan. Roast, until skin is crisp 25 minutes. 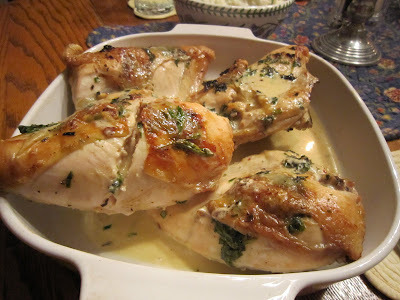 Mix 1/2 cup heavy cream, 1/4 cup chicken stock and 10 tarragon leaves. Remove pan from oven when done and remove some of the juice. Pour cream mixture in the pan, allowing some to run all over the chicken. 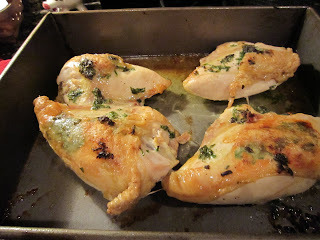 Return to the oven for another 5-7 minutes depending on how thick your chicken is. Remove the chicken onto a dish and then whisk the cream with the brown bits in the hot pan. Carefully pour the sauce over the chicken and serve. This not only looks pretty, but tastes wonderful with fresh herbs. The butter under the skin makes the chicken oh so moist, and your guests are sure to go home thinking you might just be Martha yourself. Everything on your blog looks so yummy delicious. I'm totally going to try some of these recipes. How wonderfully creative!!! Thanks, Soryda! It's a fun creative outlet for sure!